General Description of LH, alpha. 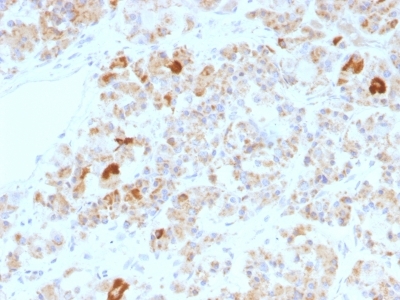 This MAb reacts with a protein of ~13kDa, identified as alpha sub-unit of Luteinizing Hormone (LH). Its structure is similar to the other glycoproteins, follicle-stimulating hormone (FSH), thyroid-stimulating hormone (TSH), and human chorionic gonadotropin (hCG). The protein dimer contains 2 polypeptide units, labeled alpha and beta subunits that are connected by two bridges. The alpha subunits of LH, FSH, TSH, and hCG are identical, and contain 92 amino acids. The beta subunits vary. LH has a beta subunit of 121 amino acids (LHB) that confers its specific biologic action and is responsible for interaction with the LH receptor. This beta subunit contains the same amino acids in sequence as the beta subunit of hCG and both stimulate the same receptor ;however, the hCG beta subunit contains an additional 24 amino acids and the hormones differ in the composition of their sugar moieties. LH is synthesized and secreted by gonadotrophs in the anterior lobe of the pituitary gland. In concert with the other pituitary gonadotropin follicle-stimulating hormone (FSH), it is necessary for proper reproductive function. In the female, an acute rise of LH levels triggers ovulation. In the male, where LH has also been called Interstitial Cell-Stimulating Hormone (ICSH), it stimulates Leydig cell production of testosterone. LH is a useful marker in classification of pituitary tumors and the study of pituitary disease. enQuire Bio's LH, alpha Anti-Human Monoclonal is available for Research Use Only. This antibody is guaranteed to work for a period of two years when properly stored.